2018 was a record year for liver and kidney transplants conducted at Schneider Children’s. 2018 was a record year for liver and kidney transplants conducted at Schneider Children’s. Over the past year, 44 (20 liver and 24 kidney) transplantations were performed in children from all over the country who needed the life-saving procedure. 11 liver transplants were conducted following cadaveric donations, 8 following a donation from a living relative, and 1 from an altruistic donor. 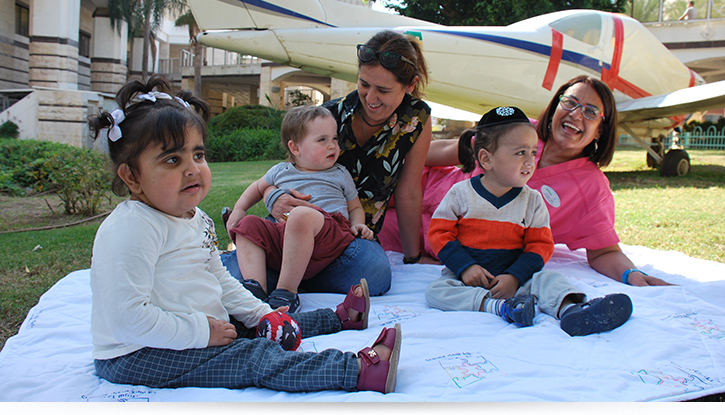 The youngest liver recipient in 2018 was 5-month-old Yonatan from Jerusalem who suffered from a congenital defect in the bile ducts. 12 kidney transplants were conducted following cadaveric donations, 12 following a living donor. The youngest kidney recipient in 2018 was 2½-year-old Rafael from Modiin Illit, who suffered from kidney dysfunction. The liver and kidney transplants were performed by Dr. Michael Gurevich and Dr. Sigal Eisner, senior surgeons in the Organ Transplantation Department at Schneider Children’s. In order to conduct the organ transplants, operations that are already complex, and more so when small children are the recipients, special preparation is required by the multidisciplinary teams at the hospital which include transplant surgeons, ultrasound technicians, gastroenterologists, nephrologists, a transplant coordinator, dietician, dialysis team, anesthetists, surgical nurses, intensivists, inpatient department C which supervises post-operative care, and more. All are highly experienced professionals in the field of pediatric organ transplantation.